Sedation dentistry allows our Grand Island dentists to perform a variety of dental procedures on patients who experience dental anxiety. Patients who undergo dental sedation generally have a higher pain tolerance, decreased sensitivity to smell and sound, and a greater sense of relaxation during the entire procedure. Here at Island View Dental, we are licensed and certified to provide nitrous oxide sedation and oral conscious sedation, with more than 40 years of experience practicing sedation dentistry. 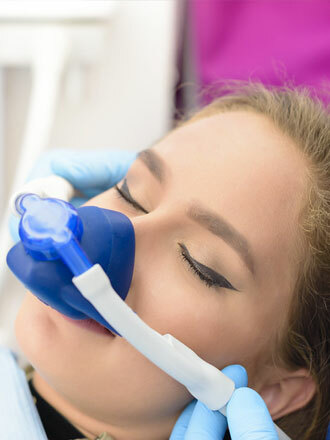 Inhalation — Nitrous oxide, or laughing gas, is the most frequently used sedation method at our Grand Island dental office. You remain awake or very sleepy throughout the entire procedure and are able to breathe on your own, but you will feel a great sense of relaxation. It is effective in easing mild to moderate anxiety. Recovery is quick so you can resume your normal activities immediately. Oral Sedation — An extremely common technique for dental sedation is oral conscious sedation. It is easy and does not require the use of needles. With conscious sedation, you will remain awake throughout your procedure, but will be in a deep state of relaxation. You will be given a prescription pill which, taken about an hour before your appointment, will have you fully relaxed by the time you arrive at our office. It is recommended that patients who receive conscious sedation have a parent, spouse, or friend accompany them to appointments because it can take several hours for the sedative to wear off and driving may be unsafe. Sometimes, simple distractions can make all the difference in your dental experience. We provide several options, including personal TVs and music, to help you relax during your appointment. Please contact our Grand Island dental practice to schedule a consultation, learn more about sedation dentistry, and find out which sedation dentistry method may be right for you.